I love my personal trainer, Cindy. This graduate school life doesn't necessarily provide me with the extra money to afford her at the moment, but working with her is so worth it. I forgo shopping (gasp!) to afford a few sessions a month. I fell off the wagon for a little while, but I'm back on track with my eating. Hubs even bought me a FitBit for Christmas, so I'm all 'bout that calorie-burning life right now. The hardest part of using the FitBit is facing the reality of my sedentary lifestyle. This is my data for this week. Yeah, it's hard to look at. Writing a dissertation, commuting, and sitting in meetings doesn't lend itself to being super active. Anyway, realizing that I need to leave behind the chub I've gained in grad school, I've recommitted myself to burning some fat. So I'm back to working with Cindy a few times a week. Ouch and no ma'am. This, my friends, is called the Jacob's Ladder. If you went to Vacation Bible School like I did growing up, you'll remember Jacob, Esau's brother, fleeing from his home because he had stolen Esau's birthright. Esau was out to get him. On the run, Jacob found a place to rest, and had a dream in which he saw a ladder. God was standing at the top of the ladder. In the dream, God promised Jacob safety and blessings for his future. Some Bible scholars say that the ladder represents Jesus as the connection between man and God. Let's just say I need Jesus when I'm on this contraption. The makers of this piece of equipment claim that it is a total body workout, and they aren't lying. After about 2 minutes of this thing, I just don't know if I'm going to make it. Despite it making me sweat and keeping me on the verge of tears, there are a few things I like about it: (1) It's easy on the joints. This is important to these old bones. (2) I can control the speed, and no matter how fast or slow I'm going, I'm getting a full-body workout. 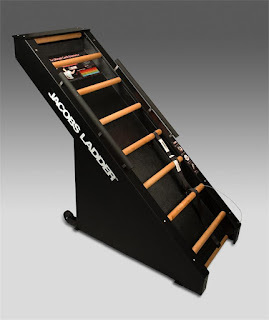 As much as I hate the Jacob's Ladder, I'm committed to mastering it. Before the wedding, I could knock it out. I'll be back on it this week, complaining and fussing and almost crying, but I'll be back on it. Maybe I'll imagine that it's bringing me closer to God like it did for Jacob. I believe our bodies are our temples, so in some ways, it actually is. Training with you is a privilege! I am so proud of you for how hard you push through tough sessions. Seeing your determination and watching you meet each goal that you set is so motivating to me. You are awesome. And yes, I cry when I put myself on Jacob's ladder too! But there is always a blessing to be found both in the climb and at the top. I'll be there for you the whole way! Love you. Cindy!!! Thanks for posting! You are the BEST.